English painter, sculptor, and engraver of animal subjects. He was the son of an engraver and writer, John Landseer (1769-1852), and was an infant prodigy. 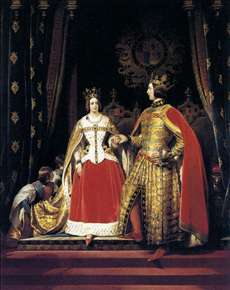 His life was one of continuous professional and social success; he was the favourite painter of Queen Victoria (who considered him very good looking although rather short ) and his friends included Dickens and Thackeray. The qualities in his work that delighted the Victorian public, however, have subsequently caused his reputation to plummet, for although he had great skill in depicting animal anatomy, he tended to humanize his subjects to tell a sentimental story or point a moral. His most familiar works in this vein include The Old Shepherd s Chief Mourner (Victoria and Albert Museum, London, 1837), Dignity and Impudence (Tate Gallery, London, 1839), and the celebrated The Monarch of the Glen (Guinness plc, Edinburgh, 1850). 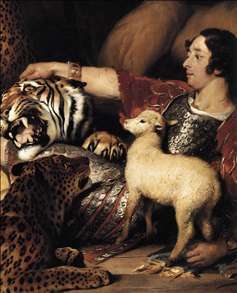 Other paintings by Landseer have been attacked for their cruelty (he made many visits to the Scottish Highlands and frequently painted scenes of deer-hunting). 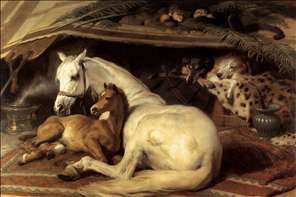 Apart from animal subjects, Landseer also painted portraits and historical scenes. As a sculptor he is best known for the lions at the base of Nelson s Column in Trafalgar Square, London, unveiled in 1867. Landseer s health broke down in the 1860s, and in his last years he suffered from bouts of madness, aggravated by alcohol. His brother Thomas (1798-1880) was an engraver, whose prints played a great part in popularizing Edwin s work. Another brother, Charles (1800-79), bequeathed £ 10.000 to the Royal Academy to found Landseer scholarships. 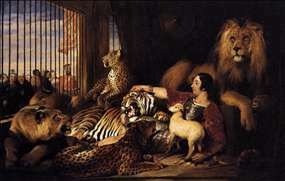 See more details about "Isaac van Amburgh and his Animals"
See more details about "Isaac van Amburgh and his Animals "
See more details about "Queen Victoria and Prince Albert at the Bal Costumé of 12 May 1842"
See more details about "The Arab Tent"